Many hedgehogs have developed fatal liver problems due to diet of too much fat. For many years, cat food has been the default food for domestic hedgehogs but many cat foods are too high in fat and low in protein to be healthy food for hedgehogs. Over time, hedgehog-specific food has been developed but don’t blindly accept it based on the label. The only way you can guarantee the healthiness of your hedgehog’s food is to analyze its fat, protein and carbohydrate content. Choose food (whether in the form of cat or hedgehog food) that guarantees a composition of at least 30% protein. Don’t feed your hedgehog any food with a fat content of over 12%. Make sure your hedgehog gets a good amount of fiber (food with 10% fiber analysis will work well), because fibers can partially substitute for some of the substances that a hedgehog would normally consume in its primarily insect diet. Although traditionally classified in the now abandoned order Insectivora, hedgehogs are not exclusively insectivores but are almost omnivorous. Hedgehogs feed on insects, snails, frogs and toads, snakes, bird eggs, carrion, mushrooms, grass roots, berries, melons, and watermelons. In fact, berries constitute a major part of an Afghan Hedgehog’s diet in early spring after hibernation. The hedgehog is occasionally spotted after a rainstorm foraging for earthworms. Although forest hedgehogs, most well-known to Europeans, are indeed mainly insectivores, this is not necessarily true for other species. The fact that hedgehogs eat tons of insects in the wild should explain why we want to feed them so much protein without the fat. You might wonder why you shouldn’t feed your hedgehog a domestic diet of mainly insects. The answer is kind of complicated. Feeding your hedgehog feed-insects like crickets and mealworms is excellent as an occasional delicacy, but pet food insects contain much more fat than a hedgehog would normally eat in the wild. That spells liver problems. Why not feed them wild-caught insects? Hedgehogs aren’t susceptible to much poison in the wild unless it is ingested in insects. The wild insects you catch might be carrying insecticides that are seriously harmful to your hedgehog. As an occasional treat, you can also give your hedgehog a tiny morsel of lean and cooked chicken or other meat. Your hedgehog may enjoy small pieces of fruit and tiny portions of vegetables as treats too, but stay away from sugary food and dairy. In addition to food, a hedgehog needs clean, fresh water all the time. Water bottles are recommended if you use newspaper shavings for bedding, since the shavings will fill a water bowl. 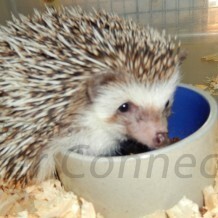 Any food or water bowl should be wide and shallow, so a hedgehog can’t knock it over as he scampers. Hedgehogs can be extremely resistant to any change in their life, including trying of new foods. The best suggestion one can give is to keep trying other foods. Anything hard or overly sticky (like raisins) should be avoided. These foods can become lodged in their teeth or the roof of their mouths. Fruits: Apples, pears, bananas, strawberries, watermelon, blueberries, applesauce and cantaloupe. When you introduce these fruits to the hedgehog, cut them into small pieces to make it easier for them to eat. Vegetables: Carrots, sweet peas, sweet potatoes, and green beans. All of these should be cooked without seasoning. Again cut these to sizes that are easy to eat or mash them. You can also try some of the vegetable and fruit varieties of jarred baby foods. Watch the ingredients though, stay away from those with onion added and try to buy those that have lower sodium amounts. Most of all, be patient and keep trying. We have had a couple of hedgehogs that simply wouldn’t touch anything but kibble and bugs. We have also had a couple that after many attempts finally started to eat a few fruits and vegetables.